Do you want to learn how to steal your competition’s secrets? Do you want to do it an ethical way? One of the most effective ways to build a successful business is to model your successful competitors. The more information you have the higher the chances you have of succeeding. I’ve been watching the show Billions on Showtime. The main reason why Bobby Axelrod (the hedge fund manager) the show’s protagonist, is successful is because of insider information. He makes trades knowing beforehand facts about a company before they are made public. The show is a great cat and mouse game between Bobby Axelrod and the district prosecutor. I’m not advocating you do illegal things, instead, you can use the tools available to you to gather information on your competition. In marketing, you can copy your successful competitors and model what they do, but to be a leader in your field you have to be unique. The information we gather here is strictly for own education. You can take this information and use to craft your message in a unique and compelling way. There are two types of competitive intelligence strategic intelligence and tactical intelligence. This type of intelligence is a 10,000 feet view of your marketplace. It’s supposed to answer questions of the long-term impact of new ideas and technologies. Where should we as a company be in X years? What are the strategic risks and opportunities facing us? Product – what are people selling? Price – what price are they charging? Promotion – what activities are they conducting for promoting this product? Place – where are they selling this product? Other – sales force structure, clinical trial design, technical issues, etc. For the rest of the blog post, I’ll be focusing on tips for gathering tactical intelligence. What’s working in your marketplace? What types of offers are converting? What claims and promises are being made? You must answer these questions accurately to get a deep understanding of your marketplace. This knowledge will help you make better decisions. For example, if we know a specific sales funnel works for a niche you can model what they are doing. Russel Brunson calls this Funnel Hacking. It’s very important to reverse engineer what your competitors are doing. When you successfully reverse engineer their strategies you can begin to test them for your own business. We’re doing this to gather information on what’s working in your niche. The first thing you have to do is to identify your direct and indirect competitors. Make a list of at least 12 competitors in your space. You probably already know 5 or 6 competitors in your space. However, there are a lot of different tools you can use to identify more competitors. 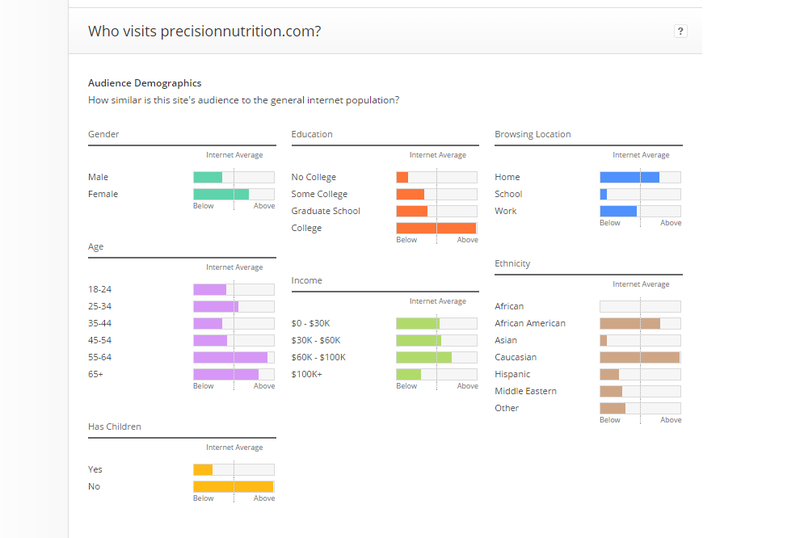 For example, I’ll be using Precision Nutrition to do a competitive analysis. Scroll all the way down and take a look at your competitors. This will give a broad overview of both direct and indirect competitors. In order to see more sites, you can sign up for the free demo. I recommend you do this to take a snapshot and find some competitors you didn’t know about. Once you’ve found a list of competitors you want to research its time to start building a database. I like using Evernote to build this database. You can easily take screenshots by using the Clip to Evernote. It also organizes different screenshots into folders. It’s important to take screenshots because the landing pages often change. Also, make sure to record the URLs into your folders. There are several tools you can use to identify your competition’s budgets. AdBeat and WhatRunsWhere are both powerful and provide good data. However, they might be out of your budget. I’ve used SpyFu and have had good success with it. The free version gives you a ton of data but if you want to take a step further I would try the paid version and use it at least for a month. Go to Spyfu and type your competitor website. 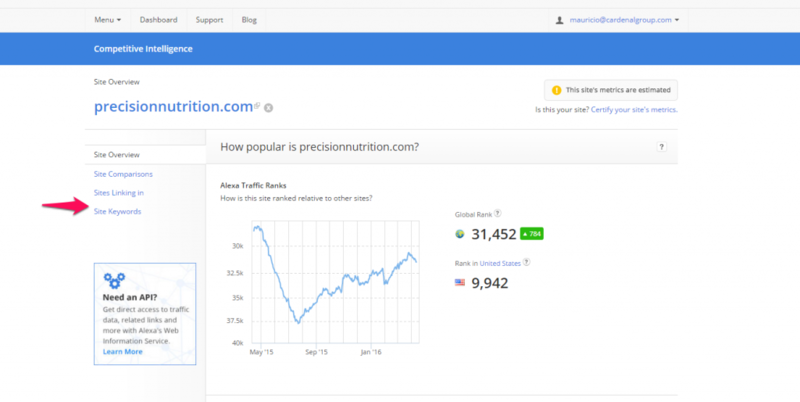 In this example, we’ll again be using Precision Nutrition. The toolbar gives you a broad overview of their SEO, PPC, Keywords, Backlinks, Outreach, and Tracking. You can also see that their only spending about $1.1K/month on Paid Search. Scroll all the way down to Adwords History and you can look at the top performing Ad and the average CPC. 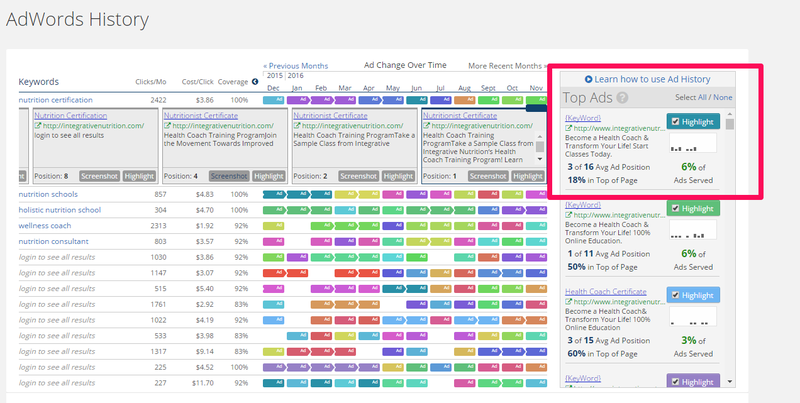 When you click PPC overview you can see their estimated PPC monthly budget, competition, keywords, and history. They have been collecting this data for over 8 years for this company. Before you start any marketing campaign it’s important to understand the psychographics and demographics of your target audience. With Alexa, you can easily get a broad overview of the demographics of your competitors. Sign up for Alexa’s Insight Plan and start with the free trial. You won’t need more than 7 days to gather data. Save these two documents in a folder. 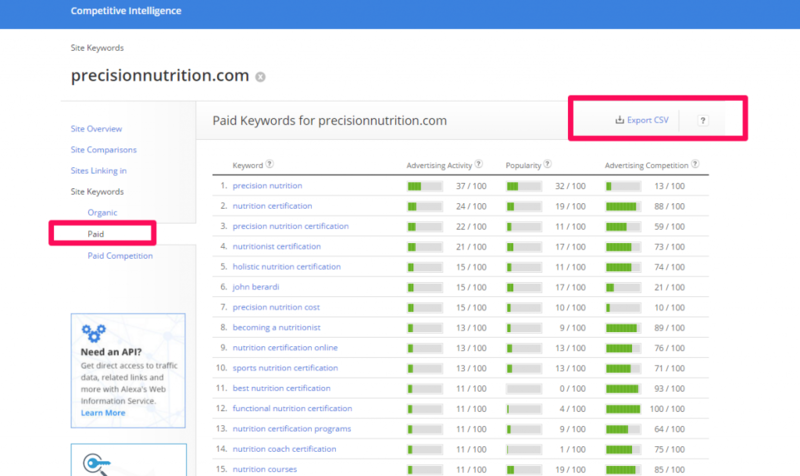 What keywords are providing your competitors with an ROI? 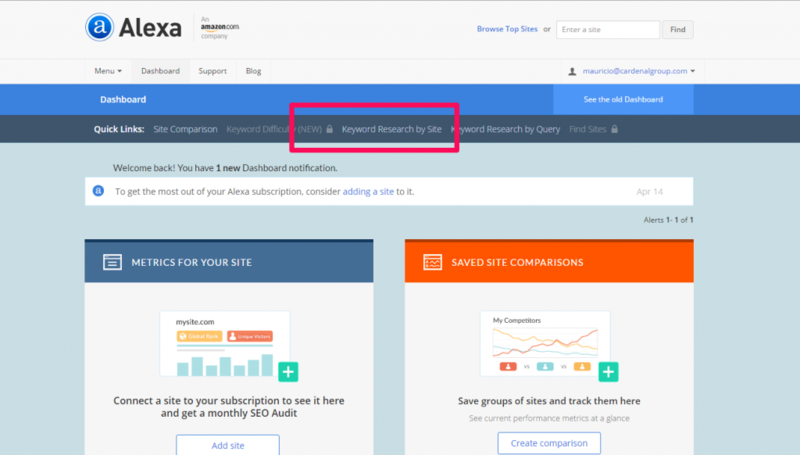 We can use Alexa to determine the most profitable keywords your competition is using. You can export the organic keywords into a CSV file. Once you have this database of keywords you can use this to create an SEO campaign targeting low competition and high ROI keywords. Building a Landing page swipe file will give provide with a great understanding of the copy, images, and offers being used in your marketplace. I use a Google Chrome plugin called Full Screen Capture . With one click of the button, I can capture the entire landing page reliably-without requesting extra permissions. They are spending over $28,000/month on PPC. Take a look at the keywords they are using and the landing page. Most of the keywords direct them to their homepage which they use as the landing page. Driving traffic to a non-targeted landing page is one of the biggest mistakes that companies make. This kills conversion rates and your relevancy scores. By now you should know how important it is to use emails to follow up with your leads. Chances are, most of your competitors don’t have an effective email follow-up campaign. But the ones that do, you should sign up for their lists. Sign up for different offers and see what sequences they to use get their customers to buy. This will give you a great understanding of what objections they have to overcome, the psychology, and how much information is needed for your prospects to make a decision. For this step, you can either create a new email address or you can use the + sign trick. The + sign trick allows you to embed any text after your regular email address. This will allow you to filter any emails from that address. This relates to the level of awareness of your marketplace. How many similar products/services has your market been advertised to before? What unique mechanisms are being claimed? I wrote a long piece on how you can determine your marketplace’s sophistication level and the best strategies for each level here. 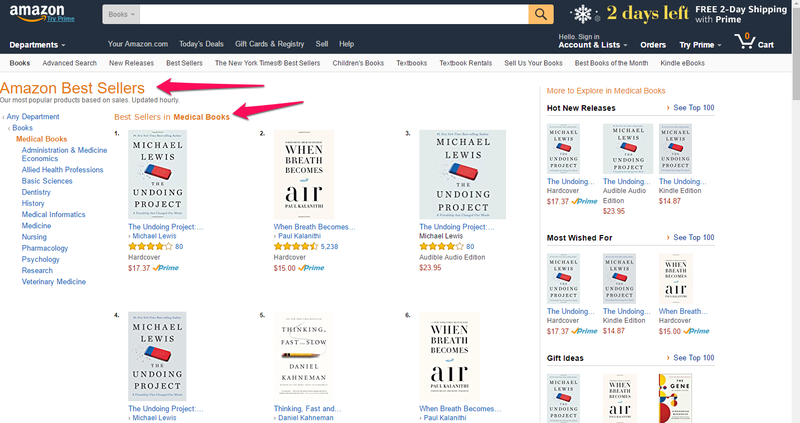 9 What Buying Patterns Can You Find From Amazon? Amazon is the world’s third largest search engine. Unlike most channels Amazon’s users are looking to buy right away. A great way to find what information your prospects are looking for is to look for the best sellers in your niche. What books/videos are your prospects buying? You can then use this information to learn what your prospects are reading and who are the leaders in your space. I bet you’ll discover some new people that you didn’t even know existed. Another fantastic that provides lots of insights into your competitor’s data. One it’s best features is seeing your competitor’s top referring sites. This allows you to know where exactly they are getting their traffic from. This is a great way to find affiliate traffic. This is probably my favorite tool. It provides a broad overview of your competitor’s SEO and PPC information. 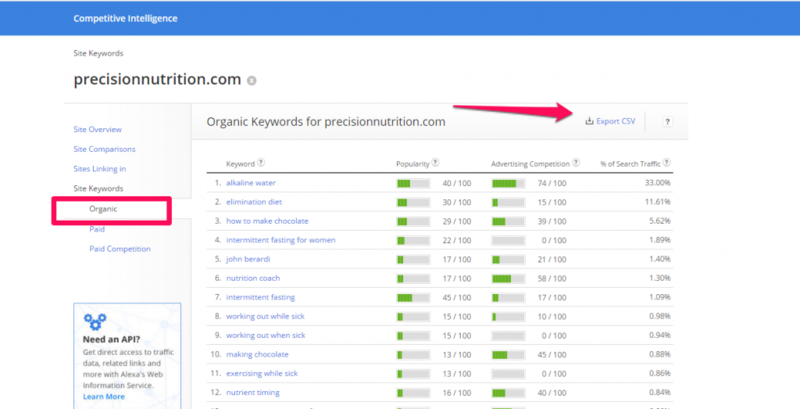 You can look at different Keywords, Landing pages, competitor’s competitor’s, and traffic overview. This Google Chrome plugin allows you to what scripts your competitors are using on their sites. For example, if your competitor is doing Facebook Ads and Google Remarketing you can find the scripts on Ghostery. 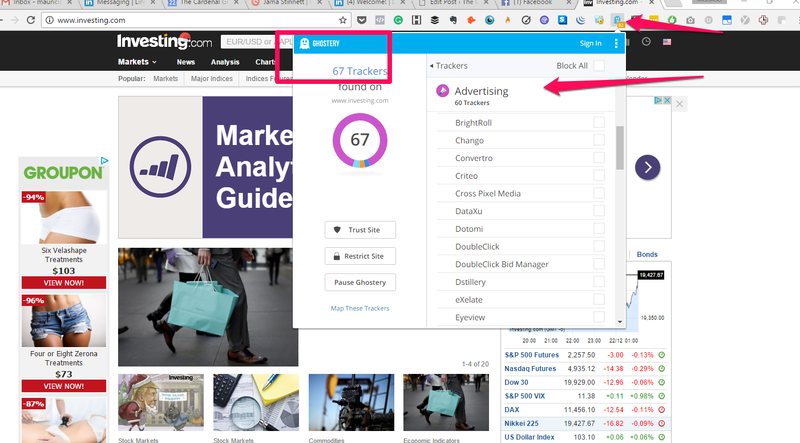 Take a look at the trackers from Ghostery from the site investing.com There are over 67 trackers on this site. This is a quick way to know what they’re doing with advertising. There are a lot more tools you can use that I won’t get into here, but this is will provide you with a good start. Finally, in order to see the entire sales process, I highly recommend that you buy your competition’s products/services. This information is strictly is educational purposes. I don’t recommend that you copy your competitors as this can hurt you long-term. In order to truly stand out, and be the leader in your space you must be unique and different. However, you can take what your successful competitors are doing and model the must successful parts of their marketing. What do you think? Have you ever spied on your competition before? This is an exceptional article. Very well done. That is one comprehensive article! By the way, we are AdSpy.com – the largest Facebook and Instagram Spy Tool. We came across your blog about spying on competition and were wondering if you would be interested in promoting or reviewing as well our social media ad intelligence tool called AdSpy and possibly add us here in your blog post or write a separate review about it as a new social media ad spy tool this 2018?